Although St. Herveus (Herve) who lived in the sixth century is still venerated all over Brittany, very little genuine information on him survives. The first detailed Life of this unique holy ascetic was written only in the late Middle Ages. However, besides these late sources, numerous Breton traditions and pieces of folklore testify to St. Herveus and his veneration in Brittany throughout many centuries. It is certain that St. Herveus was blind from birth. He led the ascetic life for many years, taught, preached, healed and performed miracles. By all these deeds he gained the general love of the Breton population. He is still considered by many to be one of the principal patron-saints of the region, and the name “Herve” (and probably some other forms of this name) remains one of the most popular baptismal names for boys. The holy man is also venerated as patron of horses. 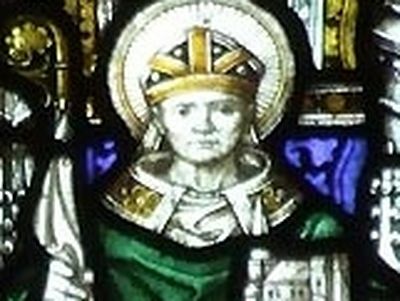 St. Herveus was born probably in southern or south-western Wales. His father was a bard named Hyvarnion. 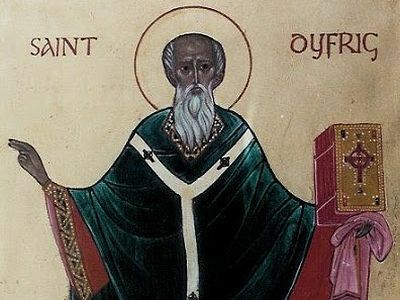 According to later traditions, Hyvarnion, a wise and devout Christian, was a disciple and friend of the Venerable Martyr Cadoc of Wales who for some time lived as a hermit in Brittany near Vannes. St. Herveus’ father had lived as a young man for four years at the court of the Frankish king Childebert (ruled 511-558) of the Merovingian dynasty. He played the harp and was famous as a skilled musician. It is written of Hyvarnion that he was handsome, had a very sweet voice and he much pleased the king by his singing and playing the harp. But Hyvarnion decided to return to his native Britain and devote the rest of his life to the service of God in chastity and solitude. However, the Lord had another plan for him. Before his departure an angel appeared to Hyvarnion at night and said that on the following day he would meet a young lady whom he must marry. The angel also predicted that they would have a son who would become a great man and an ardent servant of Christ. The same night the angel appeared to Hyvarnion’s future wife who also wished to dedicate her life to the service of God and predicted for her the same thing. On the following day, riding on horseback through the woods of Brittany, Hyvarnion heard marvelous singing. Amazed, he dismounted to find out who was singing with such a beautiful voice. And in a sunny clearing he spotted a lovely young lady who was gathering herbs. “What kind of herbs are these?” he asked. “This herb that I have just found drives away sorrow and gives happiness. But I still cannot find a herb which saves from blindness and one which gives eternal life and delivers from death,” replied the girl who was called Rivanone. Hyvarnion came to love her at once, soon they were married and, according to later authors’ evidence, moved to Wales where three years later, in about 520, their son was born. But the parents’ joy soon changed to sorrow when they learned that their infant was blind. In sorrow they gave him the name “Herveus” which means “bitterness,” not knowing that the whole life of their holy son would be filled with spiritual joy and bliss and that he would lead many to salvation. Realizing that it was the will of God that their son had been born blind, Hyvarnion and Rivanone thanked the Lord that their baby would not see this sinful world with his physical eyes and began to pray hard so that their infant would be vouchsafed to contemplate the beauty of the celestial world. It is said of Herveus that he had blue eyes, an exceptionally bright face and a rare beautiful voice (as was the case with his parents). According to tradition, when Herveus was two years old his father died and the family was left practically without means of subsistence. Rivanone raised her son in piety and love for God. She sang him songs and taught him to sing, so Herveus from his infancy gained a profound love for music and poetry. And when they had nothing to eat they went into the street to sing to passers-by to earn some money to make ends meet. People liked their songs very much and gave them alms eagerly. Once, when the boy had grown a little, Rivanone fell ill and lay in bed. Thus little Herveus decided that it was his turn to labor and earn his and his mother’s bread, but as he was unable to walk without a companion, by Divine providence a small white dog was sent to him which accompanied him from that time. Welsh people for a long time preserved the memories of how the blind infant Herveus, led by a little white dog which he held on a rope, used to wander from village to village, singing songs and begging. And Bretons to this day like to sing a ballad of a blind barefoot child, accompanied by a white dog, who sang although his teeth shivered with cold, and his body, chilled with the wind and rain, trembled. According to tradition, when Herveus turned seven, his mother entrusted him to the care of a man of holy life named Artian while she herself retired to a convent and became a recluse. Herveus lived with Artian for seven years. The ascetic implanted such a love for prayer and monastic life in the teenager that the latter never thought of choosing another path of life. And, loving God, Herveus praised Him by singing, for he knew many spiritual chants by heart from infancy. 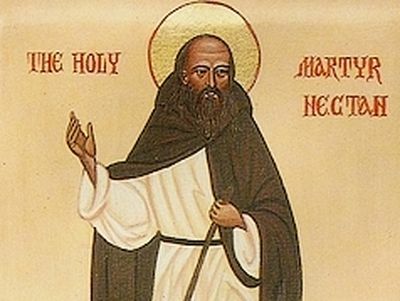 When Herveus was fourteen, with the consent of his mother he was taken to Brittany where his uncle led an ascetic life to the glory of Christ and headed a school at a small community of monks that he had founded in the forest close to Plouvien. The uncle fondly received his nephew and Herveus began to study together with the others. According to tradition, throughout the journey to Brittany birds sang around Herveus, greeting him and “saying” that he would surpass even many of them with his singing abilities. Soon it emerged that Herveus, despite his blindness, surpassed all other students both by his abilities and diligence. Studying at that school, not only did young Herveus acquire knowledge, but he also perfected himself spiritually, since he had already resolved to dedicate his life to the service of Christ. When school was finished, Herveus together with his spiritual friend Guiharan started to live the ascetic life near Plouvien. Some while later they were joined by other ascetics, all becoming Herveus’ disciples. Herveus already had then the grace to heal diseases, including blindness, and all the traditions relating the saint’s life say that by his prayers he cured various ailments not only of men, but also of animals. For some time Herveus was a wandering preacher; together with some of his assistants he would walk around neighboring towns and villages, preaching the Good News; not only did he give sermons, but he also performed spiritual chants. After his uncle’s repose Herveus, who by that time had reached a mature age, became his successor in managing the monastic school and soon, in spite of his blindness, also began to rule over the monastery in Plouvien. Every morning children and youths would gather around their blind teacher whom they loved very much, with all diligence carefully listening to his teachings, then talking with him, and in the evening returned from him, like bees, impregnated with reviving nectar. First of all, Herveus taught them the spiritual sciences and a Christian way of life, but also singing and versification. The ascetic himself used to compose spiritual songs and poems and sang them to his pupils, fostering the love for spiritual chanting in them and showing by his example that in this way a Christian becomes closer to God. The saint was also noted for his close communication with all living creatures—not only angels and men, but animals and plants as well. It was said that wild animals such as wolves and foxes were among his friends and served him. Thus, at one time the ascetic was everywhere accompanied by a tame wolf. One tradition recounts concerning this wolf that one day a wolf ran out of the wood and attacked a donkey (according to another version, a young ox) which Herveus used for plowing in the field and tore it to pieces. A child who then accompanied Herveus started crying, while the saint first prayed and then began to reproach the wolf. His words affected the wolf so strongly that this wild animal in its remorse harnessed itself to the plow (that the donkey which it had eaten must have dragged) and helped Herveus till the entire field. From that day the same wolf served Herveus instead of the donkey and pulled the plow itself. It slept in a cowshed together with oxen and was as meek as a lamb. Although due to his blindness Herveus was never ordained a priest, he gained fame as the holy and active abbot of Plouvien, becoming a true spiritual father to many Christians. Once it was revealed to him that his pious and already very elderly mother who for many years had lived in Britain in full seclusion and prayer had fallen ill and was to die soon afterwards. Then the saint made the journey to Britain, bade her farewell, took her blessing and after her repose came back to Brittany in peace. Many years passed and Herveus decided to found a new monastery. Together with some of his brethren he left Plouvien Monastery that had become so dear to his heart and set out to search for an appropriate site to establish a new community. During the journey some brethren were overcome by thirst, and through St. Herveus’ prayers a spring gushed forth which existed for many years; it is supposed it was located on the way to Lesneven and was called “the holy well of Venerable Herveus.” The monks finally stopped at Lanhouarneau (in the present-day department of Finistere in Brittany) where a church was erected in a picturesque location on the river bank (according to one tradition, the church was built on the site where St. Herveus’ tame wolf stopped). A new monastery was soon built there and it gained wide renown across Brittany in a very short span of time. St. Herveus remained there for the rest of his life, living in a small remote cell and devoting all his time left after his monastic obediences to prayer. He always willingly aided the needy and consoled the suffering. Herveus was famous for his disdain for riches and he would at once distribute the gifts that were brought to him among the poor. The saint often left the monastery to go round to the surrounding settlements: he expelled demons from those who were possessed, having been ordained as an exorcist in his youth, and preached the word of God to the locals. In those years the ascetic was accompanied by his niece Christine who lived near his monastery in a tiny isolated hut of twigs and thatch which had been built for her by monks. She spent much time in prayer and escorted her uncle in his journeys. She made sure that beauty, cleanliness and grandeur always reigned at her dear uncle’s church, gathering flowers with which she decorated the altar and, while doing so usually sang spiritual songs. The monks sitting at their spiritual father’s deathbed and continually praying, at the minute of his death heard the unusual sweet singing of an invisible angelic choir, as if an assembly of angels had descended from heaven so as to meet the holy soul of the faithful servant of God Herveus and to take it right to the abodes of Paradise. This happened about the year 575. Thus reposed the Breton saint Herveus who loved spiritual singing, traveled much, lived as an anchorite, taught brethren in a monastery school in the woods of Plouvien and praised the Lord all his life although he was blind. St. Herveus was interred at Lanhouarneau Monastery which he had founded, and numerous miracles were reported at his shrine. He is venerated as a saint and commemorated on June 17 (according to the old calendar). In 878 when the threat of St. Herveus’ and other saints’ relics being desecrated and stolen by pagan Normans emerged, it was decided to translate his holy body to Brest (now a city on the westernmost edge of continental Europe) in Finistere department and to put it in a chapel there. It is known that in 1002 his relics were translated into a silver shrine and handed over to the Bishop of Nantes (now in the Pays de la Loire region). By the eleventh-twelfth centuries the veneration of St. Herveus had spread all over Brittany and outside: in the Breton Diocese of Leon the feast of St. Herveus was for a long time among the compulsory festivals. Until 1610 Bretons used to swear a solemn oath not only on the Bible, but also on the relics of St. Herveus. However, during the French Revolution of 1789 this holy man’s relics disappeared, either destroyed or hidden in a secure place and are now in an unknown location. Right up until the French Revolution a chapel close to Cleder in Finistere housed a very unusual relic—a cradle in which the holy hermit Herveus had allegedly been rocked in his childhood. In art the saint is normally depicted as a blind abbot commanding frogs not to make a noise, a wandering pauper or a singer; or accompanied by a wolf, a child along with his disciple Guiharan. His name is invoked against blindness and various eye diseases and for the health of horses. From time immemorial Herveus has been venerated as the patron-saint of blind people, bards, musicians and writers of spiritual songs and poems. It is presumed that a touching, ancient hymn of Paradise which was very popular in Brittany was composed by St. Herveus. This hymn is sung at funerals in Brittany to this day. A parish church of Guimiliau in Finistere still has a depiction of two saints who are venerated as the local patrons: Sts. Herveus and Miliau (a Breton prince and passion-bearer). Pious Bretons have never forgotten this ancient saint, venerating and praying to him to this day. Venerable Herveus, who never saw sunlight in his lifetime with his physical eyes, gained abundant grace and was illuminated by the true Sun of Righteousness—Christ, and we believe that his example can encourage many of us today to praise the Lord by our word and deed in spite of difficult circumstances. Holy Father Herveus, pray to God for us! According to some sources, Herveus’ parents did not move to Wales and he was born in Brittany in a place called Guimiliau. According to a later source, Christine was not a niece of St. Herveus, but his younger sister, being a foster-daughter of his mother Rivanone. She was as bright as sunlight and as beautiful as a flower. She called St. Herveus an uncle. According to tradition, soon after the repose of Herveus she came to his grave and started to pray hard to be taken to where the Lord had taken St. Herveus’ soul as soon as possible. And through his prayers Christine followed him to the Heavenly Kingdom at the same hour. The exact year of St. Herveus’ repose is unknown. According to various sources, he passed away between 556 and 575. They are considered the patron saints of animals, to whom you can pray for the health of animals. According to one tradition, when the saint was Abbot in Lanhouarneau, once noisy frogs nearly drowned out St. Herveus’ sermon to worshippers gathered round him by their loud croaking. The saint at once reproved them and these small creatures obeyed the man of God and from that time never made any noise during his Sunday sermons. As a young man, Nectan decided to become a monk and serve God for the rest of his life, imitating the Holy Fathers of Egypt. So together with a group of his pious relatives, Nectan boarded a boat, promising to lead an ascetic life at the site where his boat would land.